Today’s ride: Bay to Bay runs from Betterton on the Chesapeake, to the Delaware Bay. The ride runs west to east and back, and the prevailing wind can work with you and against you on the same ride. This is a flat ride, but what hills there are are near the start and finish, and some long grades and climbs that fall between miles 60 and 80. Two miles from the Delaware Bay the route enters a salt marsh, and there are biting flies to deal with. They’re an annoyance more than a hindrance, but it isn’t unusual to be bitten. The ride organizers picked up on this and use a fly in the ride logo! The Experience: I haven’t ridden a century solo in a long time. Since I knew that I’d be riding alone I arrived early and rolled out just before 7am. With very little wind and patchy cloud cover the morning was cool and I began to roll well. By the first stop I was in a good rhythm and since the morning was still cool I made it a short stop and pushed on into Delaware and toward the Delaware Bay. Since I’d started early there weren’t too many riders ahead, and while I would normally see groups of riders heading back from the Delaware Bay during the 8 mile run to the rest stop, This time there were very few. Coming back out I began to see riders coming in the opposite direction, but I was riding well by the time I left the marshes and I moved inland at a good clip. I got to the 60 mile rest stop and took my time, knowing that the flat sections were done. The next two stops were close together, one at mile 73 and another at mile 84. The short distance between them helped me adjust to the rolling terrain that greeted me after the 60 mile stop. While I was able to maintain my pace, by the time I reached the last rest stop I was feeling the difference between riding solo and riding in a group. In a group you can draft and save energy. Riding in a line can make a big difference in your pacing as well. A group of riders will even out the pace somewhat. The distance from the last stop to the finish was just about 20 miles, and they were hard miles. While I tried to maintain my fast pace, I didn’t have the energy and I had to sit up and spin more. Even so, I didn’t lose too much pace, and I finished well. 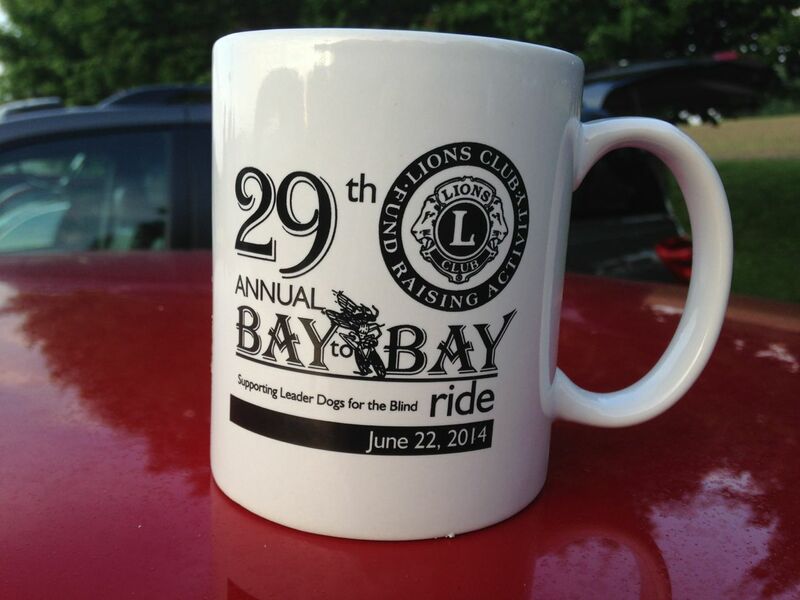 I was very pleased with the way I rode Bay to Bay, because I’m not used to riding alone and I held my pace well. Selections from my mental iPod during the ride: “Hatful of Rain” by Del Amitri, “Obscurity Knocks” by the Trashcan Sinatras, and “High” by The Cure. Stats: 103.50 Miles ridden. A strong solo effort. With other riders helping, this ride might have been even better. Ride Swag. Sadly, coffee was not included with the cup. Prior to the ride, nearly ready to set off! 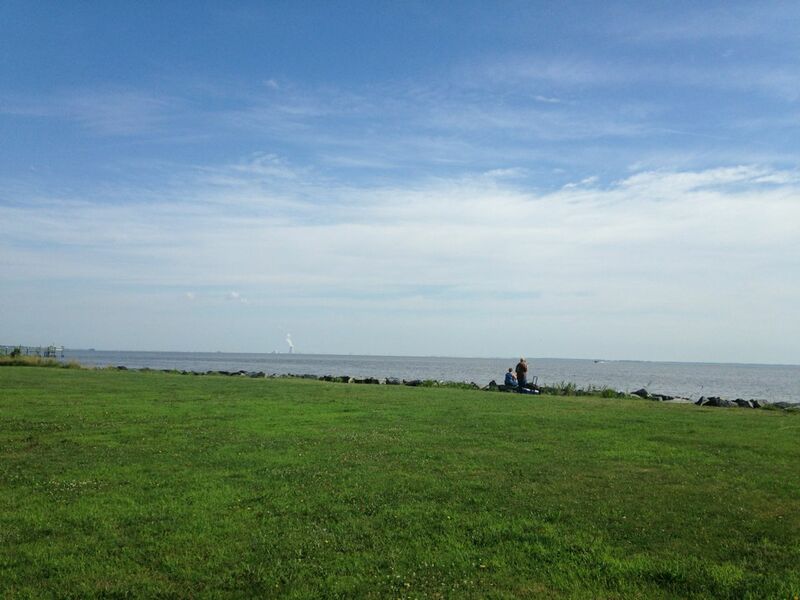 Long shot of the Delaware Bay from the second rest stop. 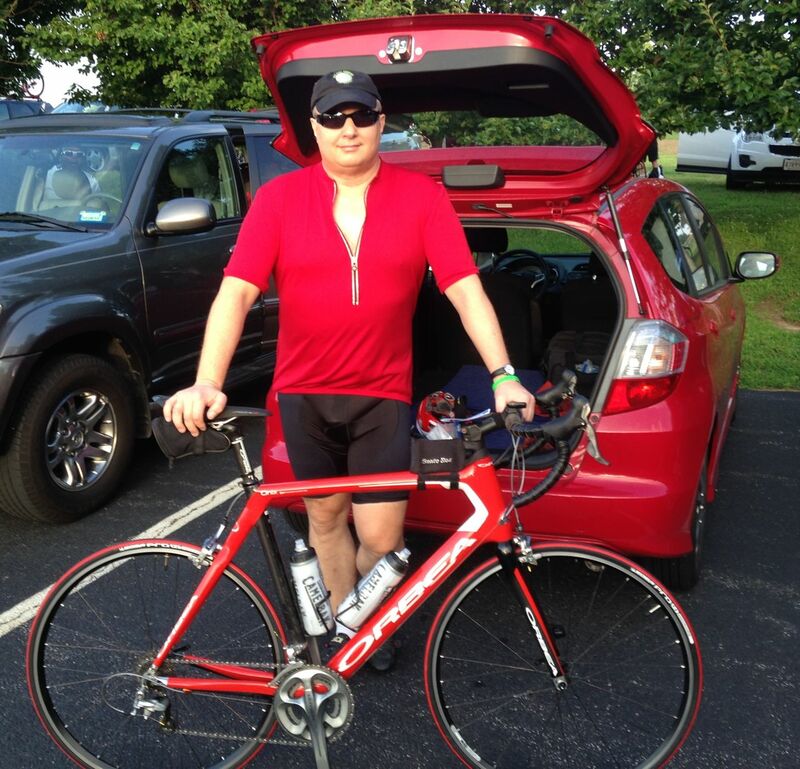 This entry was posted in Cycling on June 22, 2014 by kitefencer. Contrats Tom. I’m sure we’ve all done several solo centuries before but it’s still nice to have company. I went to Garrett County / deep Creek Lake for the Gran Fondo, I did the Savage Century – without a doubt the hardest ride I’ve ever done, with a torrential downpour for about 5 miles or so to add to the fun. My Garmin says 11,824 feet of climbing in 102 miles. It even hurts to say that. I’m doing Two Rivers next Sunday will Bill & Denise. Are you on for that one? we rode the 27 mile option but it was a good ride. the beginning takes the rider on some back roads that roll a bit & are shaded & quite pretty. at one point some monster farm vehicle followed us, growling as it rolled along but it turned off before it got too close. chestertown itself is a lovely town with some gorgeous older homes. the ride turns around at chestertown & we hit the rest stop on the way out. the older guys manning the rest stop were offering “leader dog biscuits”. i’m not sure i would want to eat dog biscuits but these were a cookie smeared w/ peanut butter w/a banana & raisins on top. i can feel my thighs growing just writing that. several people told me they were good. i’ll take their word for it. the ride back was pretty much straight up 213 so it wasn’t the winding back country roads but it was still attractive. we started the ride at 9am & finished up just after noon. pleasant but next year i want to ride 50 miles. the drive to bike ratio was reversed. we spent more time in the car than on the bike. if we do 50 next year we won’t have that problem.